Imparting education in commerce & management to build professionalism, Entrepreneurship & Leadership qualities of the students through holistic and Innovative quality education. 2) To impart effective , supportive, accessible and affordable knowledge , skills & education in commerce & management to empower the students to face the challenges in the corporate world. Goals :- 1) To provide basic understanding about Business Education among the students, for all round development . 2) To create avenue of self –employment for student. 3) To give an adequate exposure to operational environment in the context of commerce . 4) To develop Entrepreneurship skills in students. 5) To prepare students to exploit various opportunities in commerce . Commerce department started in June 1962. In progressive years Advance Accountancy and Industrial Management special subject were introduced for B.Com. course . The dept. has seven well qualified faculty; and four temporary faculty actively engaged in research and registered for Ph.D. The department has one research guides and 07 students are registered for Ph.D. and 05 Students for M.phil Degree (1 awarded for M.Phil. degree). Bridge course for B.Com I students has been conducted by department. The department conducts internal evaluation and pre-semester, remedial coaching student mentoring and encourage teaching learning process. The department has organized three university level workshops. The faculty has published of 30 research papers. Faculty involved in encouraging students participation in co - curricular activities. 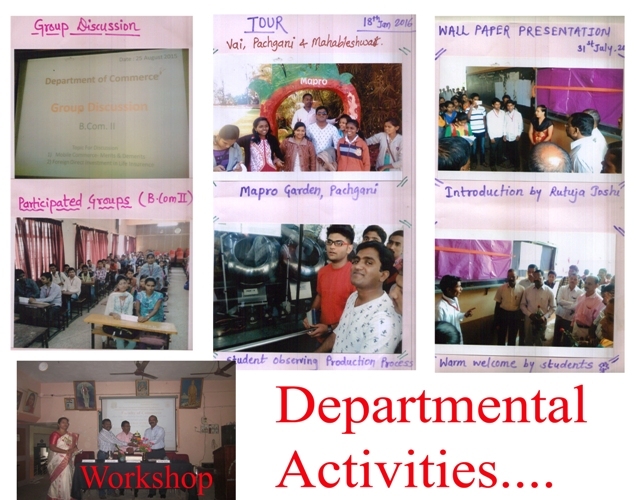 Department organized lectures of eminent experts on Various subjects . Department conducting commerce Talent Search Examination ( CTSE). The faculty provides guidance to the CA & CS aspirants. As many as above 50 plus students has achieved professional degree of CA & CS. Department has established Commerce Association and also started departmental library. Department has established MoU’s with DKTE-MBA Institute , Jaywant college,Vanketsh college Shahu College Kolhapur, Swedishi Process Ichalkaranji.